Want to imagine what my work will look like beyond the expansive walls of a gallery? Yeah, me too! Here's a peek for your viewing pleasure. Click on the image to see more. I love calm peaceful neutrals in my home and in my art, however, the arrival of spring calls for colour, and lots of it. 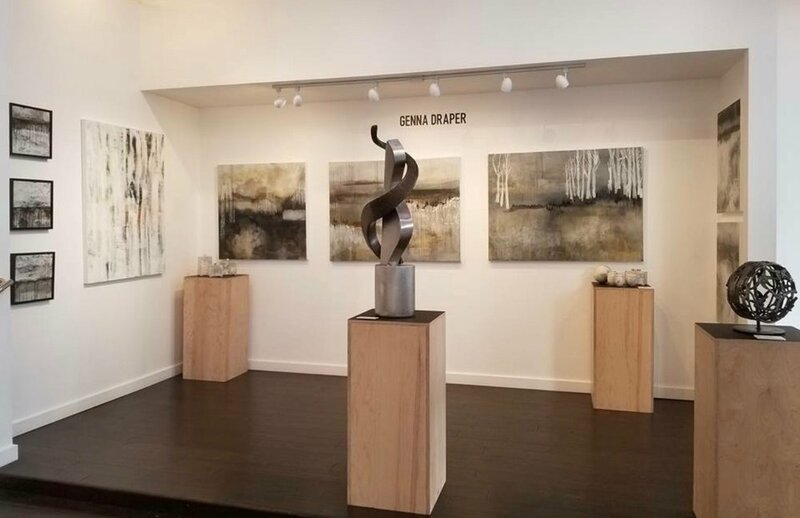 The current show at The Michael Birawer Gallery features large, modern, abstract, landscapes from my latest collection Let's Go. Come down at see for yourself or celebrate at one of the many events they have scheduled at the gallery this month. April 2018 Art Walk • Note, new pieces have been brought in to replace those shown that have sold. What a treat! This January I have the privilege of being one of the featured artists at the Michael Birawer Gallery in Seattle. The opening reception was filled with great energy, dear friends and new fans. For long time clients and fans of my work, you will recognize the neutral pallet as a staple from me; some may go as far as saying a "signature." (Ottawa fans certainly will and if you saw I how I live, you too would know.) How interesting I found it that multiple times through the evening, people complimented me on the palette and wanted to know if it was a difficult departure for me? It became very evident that bright, colourful work; something this city demanded had become my "signature" in Seattle. While I love the freedom I have as an artist to follow my muse in any direction and will continue to create with colour; I am very proud that I was able to "bring it home," and showcase work that truly reflects me and my own personal taste, with a nod to the places I come from, and a hint of where I'm going. PS. Thank you to Diane for the photos of the calm before the storm. 2015 did a number on me and my family. It stacked up to be one of the most difficult and heartbreaking times of my life. Sleepless nights in the studio lead to some of the most colourful and playful works I'd ever created. Don't be misguided; finding time to work was not a luxury to me, quite the opposite. Professionally it was a HUGE success, with my first solo show in Seattle, at Alki Arts on 1st Avenue. New fans, clients and cheerleaders became little beacons of light. I don't always know how it is that my optimistic nature comes to surface in times most would think to retreat? In retrospect though I can see it in my work and that's more than I could have hoped for. There’s no real mystery to my story. My name is Genna Draper, an eternal optimist, I look for good in every situation and each person I meet despite circumstance. This way of being served me well when we uprooted our family from our home in Ottawa, Canada two years ago. A working artist with over 20 years in the business of art, I am thrilled to be living and working in Seattle; a vibrant city with so much enthusiasm and support for artists. When did you know you’d become an artist? The only child in a large Italian family, my creative pursuits were always supported and encouraged. Drawing, painting, sewing, and building were integral activities of my daily life, and as is the case today I am happiest working with my hands. It was not a cerebral decision to “become an artist,” it was the work. For me there is no separation from creating as a child to creating as an adult, it was just what did; and what I continue to do. I suppose it was knowing I could monetize my skills that set the path. What is your medium and what attracted you to this medium? I would consider myself a mixed media artist. Paints, plasters, and resins are staples in my creative toolbox, however I would never limit myself to those alone. I am fearless in my pursuit of achieving a desired result. If that means pulling in textiles, found objects or non traditional techniques then I’m going to do it. Do you have any tricks to connecting with your creative self? I’ve never considered it as being separate part of me. Life, not just art requires creativity and problem solving. I suppose I should just thank my parents for instilling those skills in me; that and the crazy belief that I can tackle anything my my mind dreams up. Do you have any special routines that you do to help you work? There’s no magic to it. I just show up. Monday to Friday I throw on my paint encrusted clothes, grab a latte from C & P Coffee, and walk alongside my dog to my studio down the street. Getting me to work is not the issue, getting me to stop for the day is; according to my husband. What’s your greatest inspiration in creating your work? Knowing that I don’t have to be one thing. There’s a common belief that as an artist you need to commit to one style, or one thing to achieve success and I couldn’t disagree more. I believe that the skill and experience you achieve overtime can be applied to work, no matter what. I have left the “door open” to pursue any idea that I fancy. That freedom is all the inspiration I need. What are the most satisfying pieces to create? I would say that my satisfaction comes from the work and less about any particular piece. Being productive and hitting my goal, be it a deadline for a show or the successful completion of a commission then I’m more than happy. The most satisfying thing of course is knowing that people connect with my work and choose to make it part of their lives. How do you think about your art related to Modern architecture and design? My interest in architecture and design was fed from my early days as a partner in specially wall finishing business. I had the privilege of working on some incredible projects and have great respect to the work architects and designers do. The special details that to some may go unnoticed, were never lost on me. When I work on a particular series it is often with placement in mind. In the creation of my recent resin works, I considered several elements. First the environment. Living in West Seattle, I am surrounded by mountains, water and the ever changing sky. On a clear day, this place is incredible and I wanted that spark to be represented in the final pieces. I drew visual cues from the landscape overlooking Puget sound and through deconstruction created new modern landscapes. The large open spaces and clean lines found in modern homes create the perfect backdrop for this work. Thank you to Twilight Gallery for the great BIG showing. October through December 2016.